There are many different hypertufa recipes on the internet. Each individual works with a recipe that turns out for his or her own needs. The recipes are nearly the same but , as one person wants a "light" recipe and another wants a "heavy" one, you need to experiment to find what suits you. And I mean that heavy/light in both weight and in winter survival. It needs to be mentioned that a wet/frozen planter is not going to survive as well as a dry/frozen planter. So don't situate your planter under an overhang where it will be drenched in each winter rain. Move it ! And put it upon a pedestal of bricks or rings so that it is not left sitting on the wet ground..... or horror! ...in a puddle. 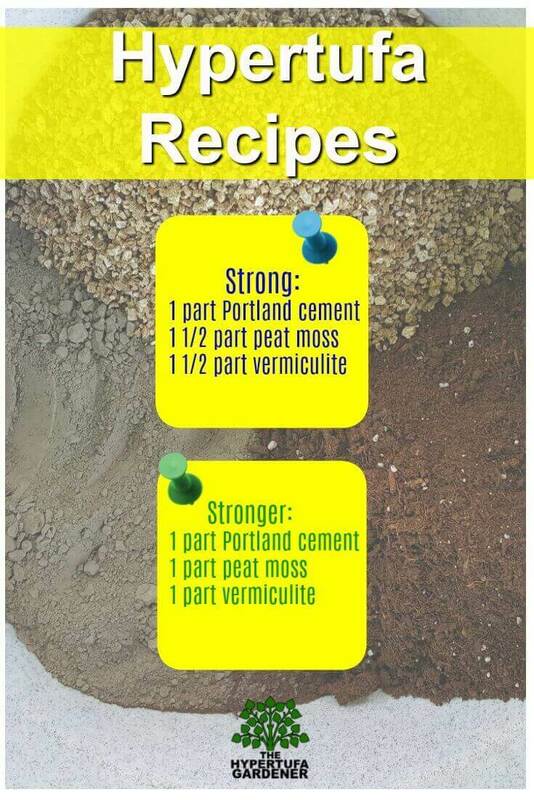 Note: This second recipe is the one I am using when I feel the need for an extra strong hypertufa pot. This is especially great for the hypertufa molds such as the ones for Easter Baskets, Pumpkins, Shamrocks so that the shape is well defined. The final ingredient is water and that is subject to your humidity etc. Add it slowly such as half gallon of water ( when you are using a gallon container as your part), then keep stirring and mixing, and adding a little at a time while you observe your mixture. You can use a short handled garden hoe, or a trowel, or your gloved hands. You will be mushing this around like making a meat loaf or brownies etc. If you have any problem getting these supplies, here is a source. I use a gallon plastic pitcher as my measuring unit most of the time. So using the ratio , I fill it once for the portland cement, one and a half times for the peat , then again for the perlite. It is the ratio you use for any measuring unit: 1 to 1½ to 1½. If you are using a pint container, then fill it once for Portland cement, and one and a half times each for both the peat and the perlite. So using this gallon as my "part", if I were doubling the above recipe, then use 2 containers Portland, and 3 containers of both the peat and perlite. You're getting the same ratio either way. Once it is mixed, leave it to set and absorb for a short time, such as five minutes. When you come back after 5 minutes, mix again and add a little water if you think it needs it. drops. Too dry and you will have a hard time molding it.